Site Recovery Manager provides unique capabilities to create, maintain, and non-disruptively test disaster recovery plans without the need for manual runbooks. The ability to automate the disaster recovery planning, maintenance, and testing process enables significant operational efficiencies. 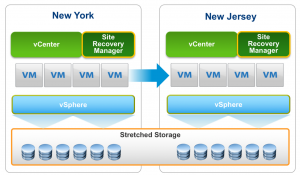 VMware has expanded the capabilities of Site Recovery Manager with the new version 6.1 release, which delivers unprecedented levels of protection and functionality as well as new use cases through the addition of capabilities such as storage policy based protection groups, support for stretched storage with orchestrated vMotion, and enhanced integration with VMware NSX. This paper will provide an overview of the new capabilities of Site Recovery Manager 6.1 and how they help reduce exposure to risk and improve operational efficiencies.